What's the Difference Between a Master's in Business Law and a Juris Doctor (JD)? 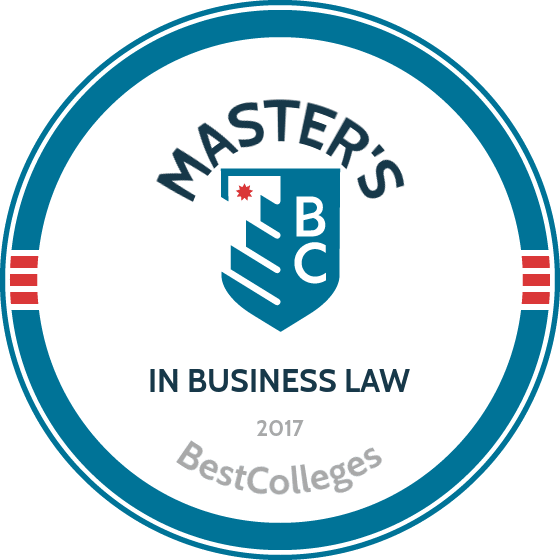 What Are The Best Online Master's in Business Law Programs? What Will I Learn in an Online Master's in Business Law Program? In a world that's increasingly connected through business, it's crucial that organizations work with professionals who can navigate complex business regulations and protect their own interests. According to the Bureau of Labor Statistics, employment rates for lawyers are projected to grow by 6% between 2016 and 2024, which is on par with the national average rate of job growth. A master's in business law online is perfect for those who are interested in both the legal and business worlds and who want a degree that will prepare them for a wide variety of positions in those fields. There are a few key differences between a juris doctor (JD) degree and a master's degree in business law. A JD degree is usually considered the first degree in law or the basic degree needed to practice law in the U.S. JD degree programs require incoming students to have bachelor's degrees and submit LSAT scores. This degree is offered by American Bar Association-approved law schools, and graduates must complete the bar exam. A JD degree typically takes three years to complete and provides students with a broad foundation in fundamental theories and concepts in the U.S. legal system. A master's in business law is an advanced law degree that emphasizes legal issues in the business world. Most business law master's programs require incoming students to already have a JD degree and boast curricula that cover business-specific areas of law rather than general legal concepts. This master's degree is ideal for legal professionals who want to enter an advanced area of U.S. or international law and for international lawyers who would like an education in American law. JMLS offers a suite of online law compliance degree programs that are ideal for professionals and can be taken on a part-time basis. The school’s 24-credit master's of jurisprudence is designed for executive-level professionals in HR, real estate, accounting, technology, and business. The school offers six areas of specialization: employee benefits, estate planning, intellectual property law, IT and privacy law, real estate law, and tax law. Each concentration in this master's in business law online has its own curriculum, providing students with the legal knowledge and training necessary to become effective in their respective disciplines. This MJ in law can also be customized to meet the student's long-term career goals. The program can be completed in two years of part-time study. Applicants must have a bachelor's degree and submit a writing sample and a resume to be considered. JMLS is accredited by the Higher Learning Commission. Tulane offers an online MJ in labor and employment law that is ideal for HR professionals, small business owners, and others who require the knowledge and credentials necessary to comply with labor laws. The 30-credit curriculum includes courses on a variety of topics, such as legal analysis, labor law principles and strategies, employment law, IP issues, negotiating skills, and gender issues in the workplace. Most students in this master's in business law online work full-time and therefore rely on the program’s flexibility to complete their degree. Throughout the program, students are required to engage in at least one Immersion Weekend on the Tulane campus, which features industry experts giving lectures and workshops as well as social activities that promote student networking. Applicants to this MJ in labor and employment law program must have a bachelor's degree and submit transcripts from all previous undergraduate institutions and a personal statement to be considered. Tulane is accredited by the Southern Association of Colleges and Schools Commission on Colleges. Loyola offers an online MJ in business law and compliance that can be completed in two years of part-time study. This 24-credit program is ideal for business professionals who are not lawyers, but who seek to develop expertise in developing and implementing regulatory compliance programs. The curriculum includes courses on a variety of topics, such as legal study and writing, securities regulation, and legal research, governance, ethics, and compliance. Students must also complete a thesis during their last two terms. This program also requires two immersion weekends, where learning objectives are reinforced and students have an opportunity to network with one another. Distance learners have access to a variety of resources, such as tutoring services, library tools, and a university writing center. Applicants to this master's in business law online program must have a bachelor's degree, at least two years of relevant experience, and must submit all college transcripts and a resume to be considered. Loyola is accredited by the Higher Learning Commission. Seton Hall offers a no-residency MS in jurisprudence that allows students to study on campus, entirely online, or in a hybrid format. This 31-credit master's in business law online is perfect for those who want a law degree but are not planning to be attorneys. This program offers five concentrations: financial services compliance, health and hospital law, pharmaceutical and medical device law and compliance, intellectual property law, and privacy law and cyber security. Each concentration has its own curriculum, but all include four required foundational classes on law and legal writing, liability for civil wrongs, business law, and torts. Distance learners are welcome to attend on-campus special events where they can meet faculty and network with their fellow students. Online courses are delivered asynchronously through Blackboard, allowing students to complete coursework at their own pace. Seton Hall is accredited by the Middle States Association of Colleges and Schools. Widener offers a fully online MJ in corporate and business law with a regulatory analysis and compliance concentration. The program is ideal for professionals such as compliance officers, corporate managers, and risk managers who are in need of compliance training. This 29-credit master's in business law online includes coursework on a variety of topics, such as corporate compliance rules, auditing and monitoring, compliance and ethics, business principles, and corporate deviance. This program uses cutting-edge technology and simulations to teach students about the intricacies of an efficient compliance program and how to resolve compliance and ethical challenges. This program can be completed in two years of part-time study and must be completed in five years from admission. Widener also offers a MJ/MBA dual program. Applicants must have a bachelor's degree and recent experience in business or a related field to be considered. Widener is accredited by the Middle States Association of Colleges and Schools. This course examines the laws that govern businesses and organizations, with an emphasis on corporations. The class covers foundational concepts such as agency, partnerships, and the structure and function of a corporation that prepare students to work as legal consultants with corporations. This course includes study on a variety of topics like business models, contracts, case laws, and statutes in fields such as film, television, social media, music, radio, and publishing. The coursework teaches students the skills needed to work as legal professionals in the entertainment industry. Students will also study celebrity privacy rights, intellectual property, and cyber law issues. This class prepares students for careers as real estate attorneys. Students learn the basic concepts of three main transactions: the purchase and sale agreement, the listing agreement between brokers and sellers, and the financing arrangements between lenders and borrowers. It is incredibly important to ensure that you enroll in an accredited master's in business law online program. Accreditation refers to a process of evaluation that ensures that a school meets certain academic standards. Schools undergo this process of evaluation to verify that they offer qualify educations. Most schools in the U.S. are regionally accredited, which is the most prestigious form of accreditation. Regional accreditation is usually pursued by nonprofit private and state schools and is widely recognized. On the other hand, national accreditation is usually pursued by for-profit institutions, religious universities, and trade or vocational schools. Accreditation is overseen by the U.S. Department of Education (ED) and the Council for Higher Education Accreditation (CHEA). The ED is a federal agency that oversees regional accreditation and individual accreditation agencies. Similarly, the CHEA oversees accreditation agencies and ensure that they comply with certain standards. You can find a full list of accredited institutions on the ED's website. Business attorneys focus on issues that affect business, such as taxation and intellectual property. In order to enter this field, individuals should earn both a JD degree and a master's of business law. Corporate counsels are lawyers who provide a business or organization with legal protection and advice on business law. These legal professionals work solely for one business. Most corporations looking to hire corporate counsels desire candidates with specializations in business or corporate law. These legal professionals assist lawyers in negotiating and drafting contracts, conducting research, and performing other legal duties. Depending on the employer, this position usually requires candidates who have a general knowledge of business law. Paralegals are not required to have a JD degree. These professors work in institutions of higher education to teach law courses to undergraduate and graduate students, either in classrooms or in law clinics. Law professors often have a particular speciality, such as business law, and should have a JD degree in addition to their master's of business law. Management analysts help organizations run more efficiently, minimizing costs and increasing revenue by advising managers and meeting with clients. Depending on the position, many employers desire candidates with either an MBA in business law or a master's degree in business law. A master's in business law online can significantly increase your salary throughout your career. In many cases, individuals with specialized master's degrees in business law can can enter mid-level jobs rather than entry-level jobs in occupations related to their field immediately after graduation. Even if you are interested in pursuing careers in business or management rather than in law, earning your master's in business law can provide you with skills relevant to the needs of a corporation and can therefore make you an even more competitive candidate for a variety of positions. Joining a professional organization can help professional business law professionals pursue educational and occupational opportunities and stay informed about current issues in the field. Professional organizations for business law professionals provide their members with opportunities to search for jobs, public their work in journals, attend conferences, and participate in other activities related to the field. For example, the ABA's business law section offers an annual conference that features networking opportunities and talks on subjects in the legal and business worlds. Additionally, many university law programs offer professional organizations in order to connect graduates with potential employers. The ABA is one of the largest and most well-known bar associations in the U.S. Its business law section has over 50,000 professional members. With over 30,000 members in 75 countries, this association supports in-house corporate counsels and corporate attorneys through advocacy work and educational resources. The IBA allows international attorneys to connect with fellow practitioners around the world. The corporate law section focuses on legal issues and social responsibility in the corporate world. There are a few different ways to fund your master's in business law online. Some students rely on scholarships from outside organizations, such as the Fulbright Scholar Program. Others rely on funding through their university, as several law programs offer merit-based scholarships and grants to top applicants. Additionally, many students rely on their own savings and income from part-time jobs. In order to access federal funding opportunities such as scholarships, loans, grants, and work-study, you will have to fill out a Free Application for Federal Student Aid (FAFSA) form.